Rio Grande City High School Cheerleaders participated at the National Night Out on October 5, 2010. 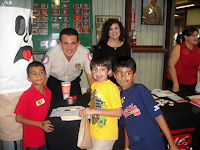 The event was sponsored by the Rio Grande City Police department and RGC Crime Stoppers. The Cheerleaders directed by Miss Hermelinda Ayala and Mrs. Yadira Montalvo performed several selections for the audiences to enjoy. The squad was also on hand to talk to children and pose for pictures. Good Job Cheerleaders! The National Night Out sponsored by Rio Grande City Police Department and RGC Crime Stoppers was held on October 5, 2010 at the Starr County Fairgrounds. The Rio Grande City CISD Guidance and Counseling Department along with the district's Police Department were present to promote the Safe and Drug Free Schools Program. RGCCISD Police Sgt. Hugo Garcia assisted Ms. Leonor Rodriguez (Guidance Counselor -Grulla Elementary) in speaking to students on the dangers and consequences of smoking tobacco and drug use. RGCCISD Safe and Drug Free Schools Director, Mrs. Adelina Villarreal and her staff provide a variety of awareness programs throughout the school year for students in an effort to educate them on the dangers of these substances. The event was deemed a success due to more than 25 organizations that participated.